I’m relatively new to the FOF family after starting in January of this year. The team – hugely friendly and supportive. 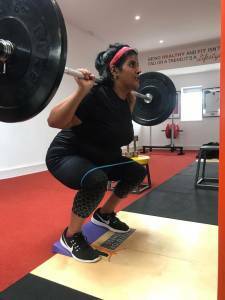 They all share the same ethos when it comes to health and fitness – it’s a holistic approach and it’s about you as an individual and your needs – there is no one size fits all. The enthusiasm they exude has quickly made the gym somewhere I want to be more and more! It feels like a family at FOF and the team genuinely care about what you’re doing. 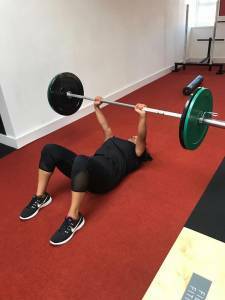 My coach – I’ve loved all the fantastic people I’ve done sessions with but building my relationship with Jon has been really important for me, he’s offered the support when I needed it and given me the push when I needed it. His ‘stopping isn’t an option’ line always springs to mind! But, I have done things I never thought I would be able to do. This mental as well as physical support has totally shaped the way I feel about exercise and my ability to push harder and do better. There is no complacency about the service at FOF – it’s not just about getting you through the door and wooing new clients, it’s the constant nurturing as an existing client that you get and maintaining this highly personal approach is what sets you apart. I absolutely love the challenging workouts and being pushed in a way I couldn’t be in faceless gym. The mixture of cardio and weight work keeps my body guessing and it means that no two sessions ever feel same. I’ve loved learning new techniques and exercises and especially finding out more about the ‘theory’ before carrying out the ‘practical’. The focus is always on the quality of what you’re doing, not just banging out reps with poor technique. The way progress is measured always gives you something to celebrate – whether it’s that you were able to go heavier with your weights, or your body fat dropped – there’s always a positive to be found and team help you find it. For me, I guess my achievements are measured in 2 ways – the first is the numbers after an Inbody, and second are the mental/psychological benefits I’m gaining. I have genuinely tried to give 100% in every session. There’s no doubt, the fat loss and change of body shape has been the biggest notable change in the last six months but it’s also noticing the improvement in recovery – seeing my heart rate going from red to yellow to green a bit more speedily is great. I can see that I’m able to handle more – my current sessions are definitely some of my most challenging and intense I’ve had and I can recognise the change in what I’m able to tackle now compared to six months ago. My energy levels are higher and that has made a huge difference to my general wellbeing. Outside of training, I’ve been able to reduce some of my medication and some of my symptoms have definitely improved. My doctors have really noticed a change in me – my cortisol levels are better managed, because my weight is reducing my hormonal imbalances are less impactful and I am successfully living steroid-free which is the biggest game changer for me after my past bad experiences. Mentally, compared to the immense apprehension I used to feel coming to a session, I’m in a much better place. And now when I see that little orange doorway in Chapel St, I’m just excited to get in and get started – that is huge for me. LOVE a leg day! Really enjoying developing my squat. Even have got some time for a Hungarian split squat! Also now really enjoying some of the upper body exercise, the flies and presses. Obviously pushing Jon on the prowler! I want to get closer to my long-term targets around weight/body fat and muscle mass and hopefully manage some of the anxiety I have around InBodys! Set some new targets and goals for my long-term ambitions. Try doing a few more semi-privates perhaps as my 4th/5th session of the week. I’d like to do a group con and/or bootcamp and push myself to exercise amongst other people and enjoy the FOF community a bit more – really would like to manage some of the nervousness I have around that. But basically, more of the same. Quite simply, it’s brought me back to life! It may sound dramatic and it actually makes me a little emotional when I think about how broken I was back in January. I was really struggling with my health issues both physically and mentally and couldn’t bear the thought that I would be feeling the way I was forever more. I came to see at a real low point knowing things needed to change. I have totally fallen in love with exercise again. I crave it, I want to do more and more and it’s made me realise that my body is capable of more than I give it credit for. I knew the power that exercise could have but it’s exceeded my expectations ten-fold. 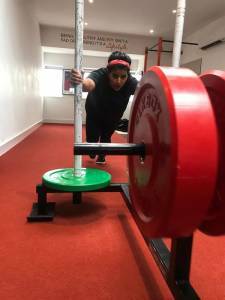 It’s given me control over how I feel – I’m not going to wake up and have my health problems disappear but I can be responsible for my day to day lifestyle – i.e I can keep training, getting stronger and I can continue to have a balanced and nutritious diet. Those things are in my power to change. And funnily enough, when those are working in a positive tandem, the other stuff is all easier to bear. This year has been one of high highs and low lows but coming to FOF has been one of the best decisions I’ve made and I’ll always be so grateful for how they’ve supported me on all levels this past six months.